Friday January 12th 1894 I ironed and made pressed chicken in the forenoon. Soon after dinner I went with Mrs Mahona to make calls over to the east side of town. It was a splendid day. Will sold green wood out of the yard here at home. I got supper after I came home and did mending in the evening after recording the papers and writing to Em Allen. 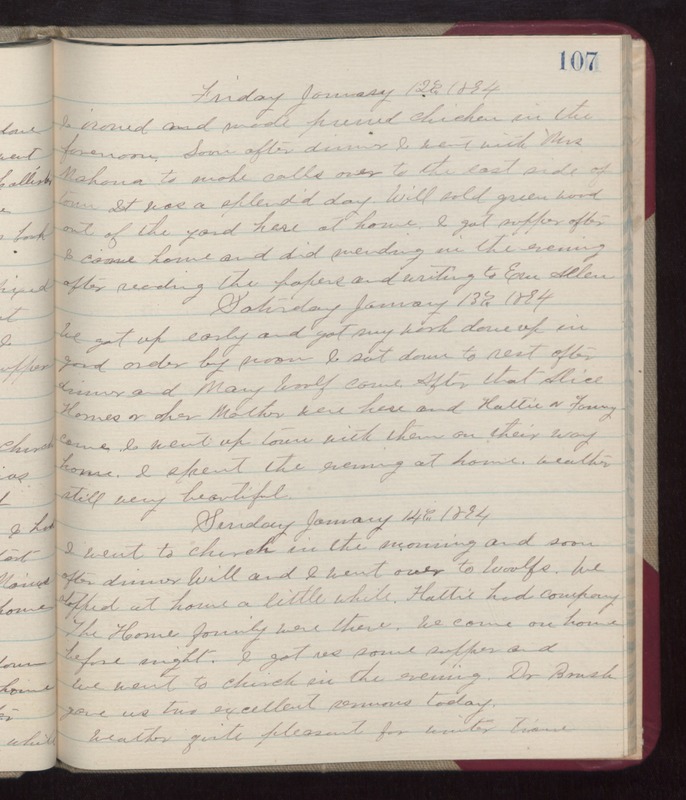 Saturday January 13th 1894 We got up early and got my work done up in good order by noon. I sat down to rest after dinner and Mary Woolf came. After that Alice Hornes & her Mother were here and Hattie & Fanny cam. I went up town with them on their way home. I spent the evening at home. weather still very beautiful. Sunday January 14th 1894 I went to church in the morning and soon after dinner Will and I went over to Woolfs. We stopped at home a little while. Hattie had company. The Horne Family were there. We came on home before night. I got us some supper and we went to church in the evening. Dr Brush gave us two excellent sermons today. weather quite pleasant for winter time.